Forty years after Gloria Steinem and Germain Greer, women are still a rarity in the corporate suite. Eager to curry favor with female customers, the investment community and the press, big companies now are looking to turn the tide. "Everyone in the U.S. is very focused on gender, and corporate boards are pushing for more equity [at the highest levels]," says Colleen O'Neill, partner at Mercer Human Resource Consulting, a unit of Marsh & McLennan. 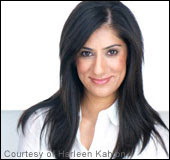 Enter Harleen Kahlon, founder of DamselsInSuccess.com, a Web site featuring job postings, monthly columns and the opportunity for aspiring female executives to mingle online. "I was seeing books out there like Nice Girls Don't Get The Corner Office," says Kahlon, 34. "I wanted to hear first-hand experiences of women who succeeded." Burned Out Or Fired Up? Who Is In the Boardroom?